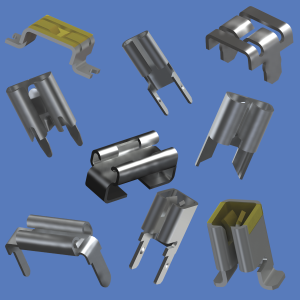 Our comprehensive line of fuse clips, contacts and holders are ideally suited for use in today’s industrial, electronic and automotive devices. For Mini, Standard and Maxi Blade Fuses. Available in (THM) Thru Hole and (SMT) Surface Mount Configurations. UL Recognition for PCB Fuse Clips. 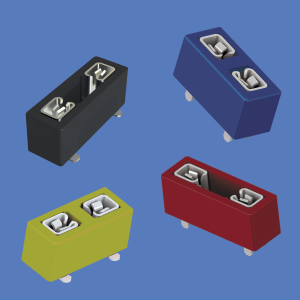 • Vertical and horizontal fuse receptacles for mini, standard and maxi blade fuse sizes. • Easily mounted and soldered to the PCB. • Mini sizes are compatible with Littelfuse ATO 297 series and Bussman ATM series automotive blade fuses. Suitable for up to 30AMP applications. • Standard sizes are compatible with Littelfuse ATO 257 series and Bussman ATC series automotive blade fuses. Suitable for up to 30AMP applications. • Maxi sizes are compatible with Littelfuse MAXI series and Bussman MAX series automotive blade fuses. Suitable for up to 50AMP applications. Surface mount fuse clips are available on tape and reel. For Mini, Low Profile, Standard and Maxi Blade Fuses. PCB Mountable for Reliable Connection and Security. 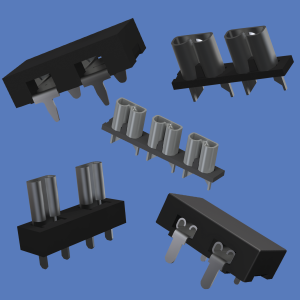 UL Recognition for PCB Auto Fuse Holders. • Pre-Assembled for easy mounting and soldering to the PCB. • Mini sizes are compatible with Littelfuse ATO 297 series and Bussman ATM series automotive blade fuses. Suitable for up to 20AMP applications. • Mini Low Profile sizes are compatible with Littelfuse 0891 series and Bussman Low Profile ATM series automotive blade fuses. • Standard sizes are compatible with Littelfuse ATO 257 series and Bussman ATC series automotive blade fuses. Suitable for up to 30AMP applications. • Maxi sizes are compatible with Littelfuse MAXI series and Bussman MAX series automotive blade fuses. Suitable for up to 40AMP applications. Thru-Hole Mount p/n 3557-2 and p/n 3587. For 1AG, 2AG, 3AG, 4AG, 5mm and 5AG (Midget- SPF) Fuses. Available in “Snap-In” and “Press-In” Mounting Configurations. • Manufactured from brass and tin plated to assure low contact resistance, and superior shelf life. 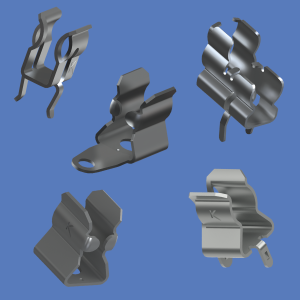 • Clips designed to mount easily and retain stable position during wave soldering. • Low profile space saving clips also feature orientation tabs and end stops to insure safety and design integrity. • Fuse Clips with End Stop are in compliance with Underwriters Laboratories Inc. (UL) component program, UL file number E354010. Please refer to specification sheets for Amp ratings. 5AG (Midget SPF) Fuse Holders. Low Profile and Slim Line Space Saving Designs. Available in (THM) Thru Hole, (SMT) Surface Mount and Snap-In Mount Configurations. 5AG (Midget / SPF – Solar Protection Fuse) Fuse Holders. 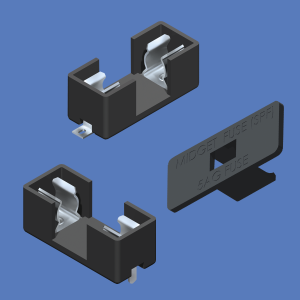 Designed to protect and Insulate SPF fuses, new fuse holders are available for Surface Mount applications p/n 3574 or Thru-Hole Mount on PCB’s p/n 3576. Optional snap-on cover wiht window option is also avaliable with p/n 3576C. Fuse holders incorporate individual spring contacts made from brass with a tin plated finish that are pre-assembled to a UL 94V-0 rated Nylon base. These holders are suitable for 5AMP @ 250V applications and will withstand shock and vibration. Contacts hold the fuse securely, assuring positive connections and low contact resistance. Color Coded Automotive Blade Fuse Holders. • Mini sizes are compatible with Littelfuse ATO 297 series and Bussman ATM series automotive blade fuses. Suitable for up to 20AMP applications. • Mini Low Profile sizes are compatible with Littelfuse 0891 series and Bussman Low Profile ATM series automotive blade fuses. Suitable for up to 20AMP applications. • 2 in 1 fuse holder is also available to accomodate both Standard and Low Profile Mini style Automotive Blade Fuses in Thru-Hole Mount p/ns 3557-2 and 3587.